Obama's huge test today: do we believe in secret law? Whether the remaining Bush-era torture memos are released in full today will say much about the new administration. Today is the most significant test yet determining the sincerity of Barack Obama's commitment to restore the Constitution, transparency and the rule of law. After seeking and obtaining multiple extensions of the deadline, today is the final deadline for the Obama DOJ to respond to the ACLU's FOIA demand for the release of four key Bush DOJ memos which authorized specific torture techniques that have long been punished (including by the U.S.) as war crimes. Today, Obama will either (a) disclose these documents to the public or (b) continue to suppress them -- either by claiming the right to keep them concealed entirely or, more likely, redacting the most significant parts before releasing them. It is genuinely unclear what the Obama administration will do today. Several weeks ago, Newsweek reported that Eric Holder had decided to release the memos -- which an Obama official described as "ugly"-- essentially in full. But then, several other sources reported there was a "war" being waged inside the Obama administration, led by former Bush-era CIA official (and top Obama terrorism adviser) John Brennan, to prevent disclosure. Yesterday, The Wall St. Journal reported that Obama is leaning towards the CIA position that only minimal disclosures are warranted, and today the WSJ reports that the memos will be released with substantial redactions to conceal the details of the Bush administration's use of "enhanced interrogation techniques" -- i.e., will suppress information of America's use of torture. I want to underscore one vital point about this controversy that is continuously overlooked and will be undoubtedly distorted today in the event of non-disclosure: these documents are not intelligence documents. They are legal documents and, more specifically, they constitute what can only be described as secret law under which the U.S. was governed during the Bush era. Thus, the question posed by the release of these OLC memos is not whether Obama will release to the public classified intelligence programs. The question is whether he will release to the public the legal doctrines under which the U.S. Government conducted itself regarding interrogation techniques he claims are no longer being used. The Office of Legal Counsel exercises the Attorney General’s authority under the Judiciary Act of 1789 to advise the President and executive agencies on questions of law. . . . Our Office is frequently called upon to address issues of central importance to the functioning of the federal Government, and, subject to the President’s authority under the Constitution, OLC opinions are controlling on questions of law within the Executive Branch. This renders blatantly frivolous the Bush-mimicking excuse that will almost certainly be offered in the event of substantial redactions today (and which anonymous Obama officials previewed yesterday in the WSJ): namely, that non-disclosure is compelled by the Safety of the American People. Aside from the fact that the "enhanced interrogation techniques" which these memos authorized are supposedly barred from use by President Obama's own Executive Order -- thus rendering any national security claims for concealment of "operational details" absurd on their face -- how can it be the case that legal opinions about what is and is not legal in the view of the Government should be kept secret? To justify the non-disclosure of these memos is to affirm the right of the U.S. Government to operate under secret laws -- about the most anti-democratic state of affairs imaginable. In her testimony, Johnsen went on to say that "the Bush Administration's excessive reliance on 'secret law' threatens the effective functioning of American democracy" and "the withholding from Congress and the public of legal interpretations by the Justice Department Office of Legal Counsel (OLC) upsets the system of checks and balances between the executive and legislative branches of government." Given that she specifically pointed to concealment of OLC interrogation memos as a prime example of tyrannical secret laws, it is impossible to reconcile her arguments with any substantial redactions of these remaining memos. It's certainly true that even OLC memos can contain legitimately classified information, as they are often called upon to opine on the legality of classified programs. 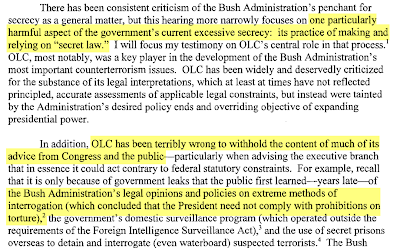 But, as Johnsen noted, secrecy of OLC memos is justified only in the rarest and most extreme cases, and here, the interrogation policies that are the subject of the memos are ones that the Obama administration claims to have prohibited entirely. Other than redactions to protect the identity of intelligence agents and (arguably) cooperating foreign governments, the only conceivable reason to suppress information of Bush's torture regime is to hide evidence of the crimes committed by government officials. No debate should be necessary to demonstrate that that concern is not a legitimate reason for secrecy. Put simply, restoration of the Constitution, transparency and the rule of law is impossible if the government continues to maintain a regime of secret laws and if it actively conceals evidence of criminality at the highest levels of government. Given the pressure being brought to bear on him by the intelligence community (which naturally opposes any scrutiny of what it did), Obama will deserve substantial credit, and will take a significant step forward in fulfilling those goals, if he releases these OLC memos more or less in full. If, however, he releases them with substantial redactions designed to hide what OLC decreed and what the U.S. government did when torturing detainees, it will be the most significant blow yet (and that's saying quite a bit) to the principles to which he endlessly committed himself during the campaign. As soon as the court and the ACLU receive the Obama DOJ's response, I will write about it in a separate post along with an interview with Jameel Jaffer, the lead ACLU lawyer in this case. Also, my post on the new revelations of NSA eavesdropping abuses from earlier today is here. UPDATE: On why today's event is such a crucial test for Obama, see The Atlantic's Andrew Sullivan (here and here), Harper's Scott Horton (here), and The American Prospect's Adam Serwer (here).